Lewellyn, known as Lew, was the first born of Lucy and Barney Cullen. Lew grew up in Ottawa, went to Ottawa High School and completed Grade 12. A restless, handsome man, Lew left home at age 18 and worked as time-keeper with a CPR Section Gang on the North Shore Line (Hull to Lachute, Quebec). He then went to the Magnesite Mines as time-keeper. He then worked for The Foundation Company of Canada in New Brunswick as an engineer and later in Cornwall, Ontario at the construction of a silk mill. In 1932, he joined the Ottawa Police Force and, except for war service with the RCAF, was a policeman until 1953. 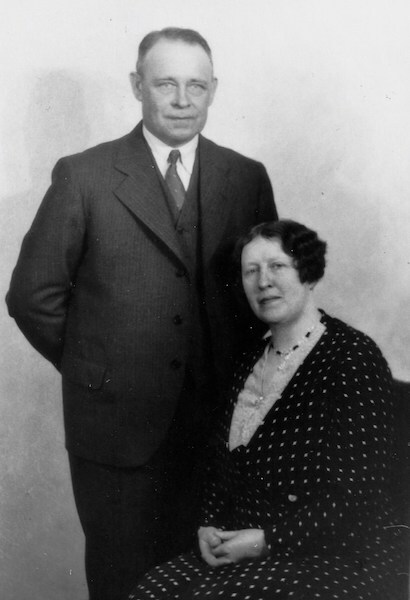 In 1932, Lew married Vivien Connolly, the eighth child of Cholestic Girouard, a teacher, and John Connolly, a blacksmith, from North Bay. They had three children - Bernard, Anne and Trevor. Vivian died in 1950. The family had been living on Noel Street in New Edinburgh in the house previously occupied by Lew's parents. In 1953, Lew married Geraldine Ireland and later the family moved to West Lorne near London, Ontario. They had one son, Alan. Lew died in February, 1986 and Geraldine died in February, 1987. [S83] St. Joseph's Ottawa Mariages 1856-1984 centre de genealogie 1985, 55. [S111] Ancestry.ca; Ontario, Canada, Marriages, 1801-1928, 1933-1934, Carleton, 1908, page 184. [S42] Le Cathedral d'Ottawa 1827-1980 Le Centrade Genealogie SC 1983, 199. [S60] Saint Joseph Parish Ottawa 1856-1984 le Centre de Genealogie SC 1985, 55.